I'm very impressed with her explanations on sleeve caps for set-in sleeves. 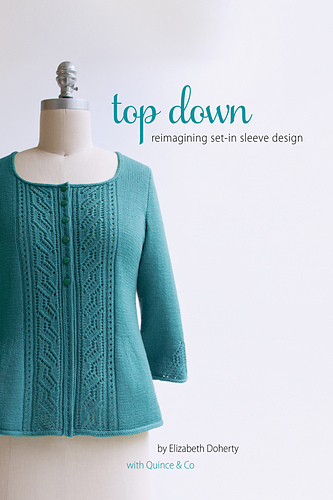 The explanations work for knitting in either direction, however you know by the title, the book focuses on top down versions. I teach a class on fitting set-in sleeves properly (Capology) and I will be recommending Elizabeth's book as a resource going forward. I've been limited in the past to referring knitters to books on pattern drafting and I'm aware most students find those resources to be intimidating. The other limitation with pattern drafting sources is they focus on the mechanics while we also need to understand concepts of fit which vary widely, especially in regard to ease allowances. I was not surprised to find in her bio Elizabeth has experience, as I do, in sewing tailored garments. There are six patterns in the book to allow you to try out the techniques. They are very detailed and include a full page schematic. Each pattern has ten sizes. The book also includes a section on adjusting fit which includes a thorough explanation on armhole depth considerations. This is something I feel is absolutely critical to good fit. In my own case I feel I look frumpy in sweaters with too deep armholes. The puckering created adds extra visual pounds and is very unflattering. You can go here to see the Look book of all of the designs.